China's Communist Party under Xi Jinping is expanding control over the Chinese government while increasing the use of covert action influence operations, according to a forthcoming congressional report. The annual report of the U.S.-China Economic and Security Review Commission will reveal that communist control over China's 1.4 billion people has increased and notes the "Party-ification" of the Chinese government. Xi also has expanded personal power by adding his brand of communism to the Chinese constitution—he is the first Chinese communist leader to do so by name—and through purging thousands of top military and civilian officials. "In one of the most significant developments of 2018, the [Chinese Communist Party] solidified its control over policy in China through what it called the ‘deepen[ing] reform of party and state institutions,'" a late draft of the forthcoming annual report says. The report is due to be made public in the next several weeks. A copy of the draft, dated Oct. 26, was obtained by the Washington Free Beacon under the Federal Advisory Committee Act. "The increase in Party control over governmental functions coincided with the additional consolidation of President Xi's control over the Party." Xi, in the clearest sign of growing dictatorial power, was reapproved as Party general security and abolished limits on the number of terms he can hold the supreme leadership post. Few academics or officials outside China have discussed Xi's drive for absolute power in China under the system of Marxism-Leninism and socialism with Chinese characteristics. The CCP also recently took control of a number of government agencies that were once part of the Chinese state. The takeover has weakened the government, the report said. The shift means China's system is doing away with traditional governance and ruling through Party "leading small groups" and committees made up of Party leaders. The groups and committees have now institutionalized decision-making for the Party. The Party control over China was on display last week in Washington. Instead of Chinese Foreign Minister Wang Yi taking part in high-level U.S.-China diplomatic and military talks, Politburo member and State Councilor Yang Jiechi met with Secretary of State Mike Pompeo and Defense Secretary Jim Mattis. Chinese Defense Minister Gen. Wei Fenghe also participated. The expanded Party controls also have led to an increase in Chinese influence operations conducted through a Party organ known as the United Front Work Department. 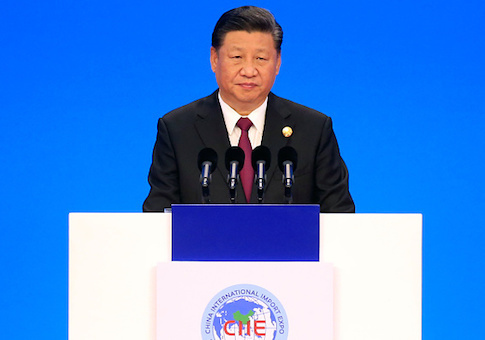 "As the CCP has consolidated power over many aspects of Chinese society, President Xi has expanded the role of the United Front Work Department (UFWD), a powerful Party entity responsible for securing the political support of or otherwise co-opting non-CCP entities within China and among the Chinese diaspora in foreign countries, including the United States," the report said. Xi elevated the department by declaring its covert and overt operations as important for the Party and to be used as a "magic weapon" in advancing Chinese strategic objectives. As part of Communist Party efforts to increase control over ethnic minorities, religious groups, and overseas Chinese, the government State Administration for Religious Affairs, State Ethnic Affairs Commission, and Overseas Chinese Affairs Office were placed under the United Front Work Department. In the past, those organizations were part of the State Council, the chief administration organ of the Chinese government. The commission report noted that China affairs analysts Julia Bowie and David Gitter regard the Work Department control over State Administration for Religious Affairs as part of a plan for "sinicization" of religions in China. The goal is to "shape religious traditions and doctrine to better conform with Chinese society and CCP objectives," they said. China is currently carrying out a major crackdown on unofficial religious groups and ethnic minorities. Christian Pastor Bob Fu, head of the U.S.-based group ChinaAid, has revealed the crackdown includes the recent closing down or harassing of numerous unofficial house churches in China and the imprisoning of Christians. In western Xinjiang Province, China has placed an estimated 1 million ethnic Uighurs into detention camps. The Uighurs, predominantly Muslim, have been targeted as a potential terrorist threat, by the Party. The Communist Party also is expanding control over film production. The Central Committee Propaganda Department was recently given direct oversight of film making and copyrights. The report said there has been "some prominent pushback" to the Party's expansion of power. Xu Zhangrun, a law professor at Tsinghua University challenged the expansion in a published article in July as returning to the class-struggle politics of the Mao Zedong era. Xu said the Chinese people are "both critical and fearful of the meaning of the revision of the [CCP] Constitution and the abandonment of term limits on political leaders." "It is felt that this amounts to a negation of the last thirty years of the Reform and Open Door policy era," he stated. "It is feared that … China will be cast back to the terrifying days of [one-man rule under] Mao." Xu said the creation of a new National Supervisory Commission, ostensibly to root out corruption, had caused China's people to feel a greater loss of legal rights and fears of "the advent of a form of KGB-style control … embroiled in the factional politics of the [CCP]." As a result of the criticism, Xu was forced to return to China from Japan, where he was a visiting scholar. The National Supervisory Commission was behind the unusual disappearance and detention in October during a visit to China of Meng Hongwei, president of the international police organization Interpol and a vice minister of public security. The report said that Meng, who later resigned from Interpol, was a victim of China's new "liuzhi," or extrajudicial punishment policy created by the National Supervisory Commission. The arrest "should cause the rest of the world to think harder about how to respond to China's … campaign to build legitimacy and influence among international organizations," Julian Ku, professor at Hofstra University School of Law said of Meng's disappearance and arrest. The National Supervisory Commission power known as liuzhi, translated literally as "to set [someone] aside," replaces an earlier extralegal detention system called "shuanggui," or "double designation." Under the old policy, Party officials had to report to a designated place and time to be detained an interrogated for alleged violations of discipline or for corruption. "Unlike shuanggui, liuzhi can be used to detain all Party and government employees," the report said. This entry was posted in National Security and tagged China, Xi Jinping. Bookmark the permalink.